Warm days and cool nights are in the forecast this week, which means it’s time to get outside and explore the Southern Appalachians. Some flowering trees, like dogwoods, have begun to bloom around Asheville, but along the higher elevations where the leaves have not yet filled in the forest canopy, you’ll enjoy unobstructed mountain views along many of the hiking and biking trails. 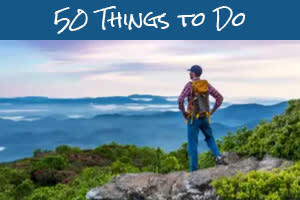 If hiking in the mountains is new for you, then be sure to check out our list of the perfect hikes for first timers. It includes trails with easy to moderate terrain, awesome views, and waterfalls. 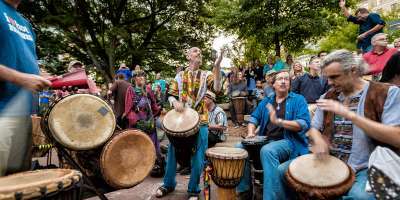 Every Friday evening, during the warmer months, a drum circle commences in downtown Asheville’s Pritchard Park. April is when this long-standing tradition typically begins, but the drummers have been coming out of hibernation early this year. 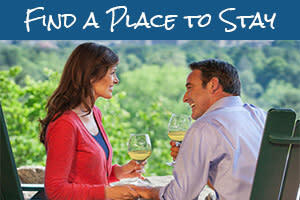 Head over this weekend and join in the fun. 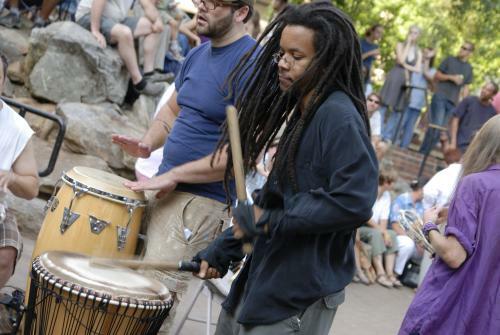 You can participate with the drummers, dance, or simply sit back to watch the scene and listen to the rhythm. 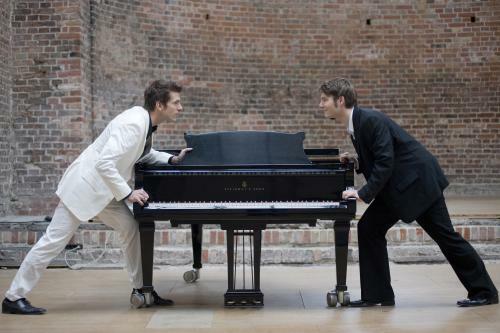 Thursday, March 28, 9:00 p.m.
Armed with two grand pianos, a heap of raw talent and a dash of wit and charm, master pianists Andreas Kern and Paul Cibis have duked it out on stages all over the world — across five continents, from their native Germany to New Zealand, South Africa to South Korea. Thursday night they battle in Asheville, and it’s up to audience members to decide which pianist emerges victorious. 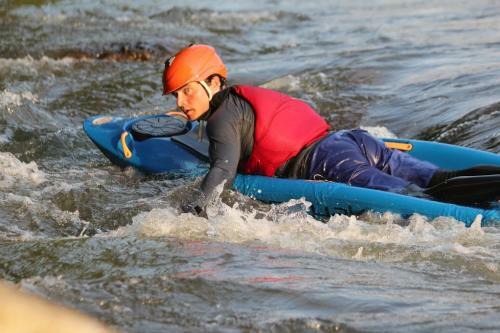 Friday, March 29, 10:00 p.m.
Friday - Sunday, March 29 - 31, 8:00 a.m.
Elite slalom paddlers and wildwater racers will compete in races down the legendary Nantahala Falls course. Spectators are invited to enjoy the show from the Forest Service walkway. This event is free to attend. Saturday, March 30 7:00 p.m.
Award winning Folk-fusion group BONOMO comes to Asheville. Formed by NYC musician Adam Bonomo, Indie Acoustic outfit BONOMO is a project that pulls at the heart strings with symphonic resonance and a distinct take on Indie-Folk music. This annual music festival features more than 16 bands including The Love Language, Linqua Franqa, Kitty Tsunami, Infinity Crush, and The Eccentrics. The festival is free and appropriate for all ages. Food trucks, family friendly activities, and community vendors including Honey Pot Vintage and Word Emporium will be on site, as well as tarot and henna artists. Saturday, March 30, 9:00 a.m. – 2:30 p.m. This exclusive driving tour will explore the east side of the Burnett Reservoir to visit part of the once thriving North Fork Valley community. Points of interest include the Sunalee Lodge, the home place of Champ Burnett, the ruins and former home site of Colonel John Connally, a slave cemetery and more. The tour includes a 5-10 minute walk from the vehicles that includes moderate terrain. Saturday, March 30, 9:00 p.m. – 11:00 p.m.
GILBERT LAWAND is a Brooklyn based comedian by way of Atlanta. You can see him performing all over the New York City area at some of the best shows such as Night Train, the Knitting Factory, and Bar Matchless as well as comedy clubs like Caroline’s, Gotham, New York Comedy Club, and the Creek and the Cave. 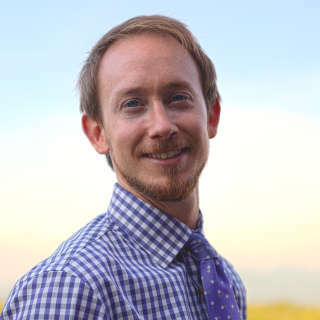 He’s a frequent opener for Rory Scovel and has also opened for Dave Chappelle and Aziz Ansari. Saturday, March 30, 11:00 a.m. – 2:00 p.m. 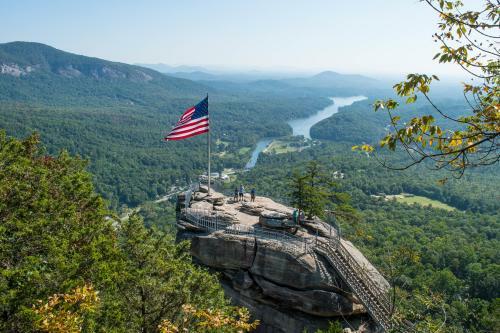 This Saturday is National Take a Walk in a Park Day, and Chimney Rock State Park will be offering several guided hikes throughout the day. A portion of Park admission will benefit Kids in Parks, which will be on site sharing information about their Track Trail program. Sunday, March 30, 9:00 p.m. The Midnight is an electronic band with an 80’s retro, melodic synthwave sound. Their music has hit the Top 20 on Billboard’s Dance/Electronic charts and No. 1 on Bandcamp. This show is open to ages 18+. Sunday, March 30, 8:30 p.m. Unspoken Tradition is one of the area’s fastest rising new Bluegrass bands. Mountain Home Music Company is excited to announce their new album, Myths We Tell Our Young. This show is the Asheville album release event. Sunday, March 31, 7:00 p.m. – 9:30 p.m.
Mary Fahl, with her awe-inspiring vocals, first achieved fame in the 1990s as lead singer of chamber-pop group, October Project. Since then, she’s released a series of compelling solo albums, including her stunning re-working of Pink Floyd&apos;s Dark Side of the Moon, Live at the Mauch Chunk Opera House and, her most recent, Love and Gravity.